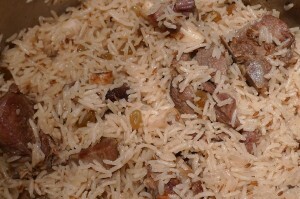 Beef, Lamb Or Chicken Pulao recipe by Tracey at DesiRecipes.com. In a pan, coat with oil and add onion with all spices. Fry for a few minutes until very aromatic. If it dries, add a tsp. of water. Add the meat and add enough water to cover. Boil for 5 minutes and reduce heat to simmer and simmer until meat is cooked. (I use a pressure cooker and pressure cook it for about 10 minutes). Meanwhile soak rice for 15 minutes and drain. Strain the broth from the meat and keep separate. In same pan as meat, add the rice and pour enough broth over to come just above the rice. The water shold not exceed 1/4th of an inch over the rice. Add more water if there is not enough of the broth. Bring to boil, turn very low (as low as possible)and cover with heavy lid and steam for 15 or 20 min. Do not lift lid to check. When done,fluff with fork. Also, if using pressure cooker for meat, don't stir too much because meat will break apart. Can I use powder cumin and turmeric or does it have to be whole? I am cooking this dish right now. Looks and smell good. Can't wait to try it. Looking nice i m cooking this today.